Uttarakhand Chief Minister Ramesh Pokhriyal Nishank today announced to give Rs 5 crore for the setting up of the Water Sports Training Institute at the Tehri Dam lake. He was speaking at the “Tehri Mahotsav” held at Tehri town today. Speaking on the occasion, he said that Uttarakhand would soon find a place on the world map in the field of winter sports, water sports and adventure sports. Representatives of various associations, involved in a decade-old struggle to get their revenue land converted into free hold, today met MLA Rajpur Ganesh Joshi, who assured them of a solution after meeting the Chief Minister in this regard. A sense of urgency among traders emanated from the announcement made by the PWD recently according to which a link road would be built near local bus stand, Indira Market. In the grand finale of the Princess and Prince of North contest held in Mussoorie yesterday, Shaila Sharma from Selakui, Dehradun, and Deepak were declared the winners, respectively. Decades of hard work, patience and determination alone can lead to accomplish a niche in the fraternity. Clad in a simple black and red cotton salwar-kameez, famous television and Hindi film actor Neelima Azim shared her journey in the tinsel town and future projects.After winning accolades for her acting in her first television soap “Phir Wohi Talaash” for Doordarshan, Neelima is now trying her hands in directing. With Valentine’s Day a week away, cupid-struck couples are looking forward to go on a shopping spree. Preparations to celebrate the lovers’ day are in full swing.Florists in the city did a brisk business today, the first day of the Valentine week. A large number of youngsters thronged the shops to buy roses on Rose Day, irrespective of what it may cost them. Jawans of the Prantiya Raksha Dal (PRD) have once again raised their demand for a separate directorate to govern the force. The Gorkha Democratic Forum (GDF), a frontal organisation of the Gorkhali community, will field its own candidate in the forthcoming Assembly elections due to the neglect shown by both the Congress and the BJP towards them. This was stated by GDF National president Surya Bikram Shahi on his recent visit to Mussoorie. Garhwal Sporting defeated Shivalik Club 2-0 to become the fourth semifinalist of the 19th Narayan Gurung Zics Memorial Football Tournament today on the Mahindra Ground here. Graphic Star surpassed SDBM by six wickets in the 60th District Cricket League at the Survey of India stadium, Hathibarkala, on Monday. Doon XI beat Rao Cricket Academy by four wickets during the Uttarakhand Twenty20 Cricket League today on the Mahindra Ground here. 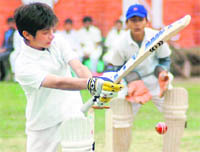 Dehradun, February 7 Hosts Raja Ram Mohan Roy Academy won their match against Shivalik, courtesy a better run rate in the first 10 overs, after the match ended in a tie in the Junior Boys Council School Cricket Tournament here today. Uttarakhand Chief Minister Ramesh Pokhriyal Nishank today announced to give Rs 5 crore for the setting up of the Water Sports Training Institute at the Tehri Dam lake. He was speaking at the “Tehri Mahotsav” held at Tehri town today. Speaking on the occasion, he said that Uttarakhand would soon find a place on the world map in the field of winter sports, water sports and adventure sports. He added that the Tehri lake would prove to be a boon for the local populace. In view of the tremendous potential at the Tehri lake for water sports, he announced the setting up of the Water Sports Training Institute. He said that the unemployed youth of the region would get employment easily after getting training at the institute. The CM directed the Garhwal Commissioner to impose a ban on the purchase of land in the region by outsiders. The CM also inaugurated a river rafting and other exhibitions. He added that by encouraging pisciculture, the local people would get employment opportunities. Earlier, the CM participated in the annual function of the Balganga College. He announced to give Rs 25 lakh for the degree college and Rs 5 lakh for the Saraswati Shishu Mandir. The CM also announced Rs 50,000 each to the family members of those who died in the accident that took place at Budhakedar and Rs 5,000 each to the injured. He also gave his consent for the Chamiyala-Kanda motor road. The CM also opened the Tehri Mahotsav at Bauradi stadium. Greeting the people on the occasion, the CM said that fairs had been an integral part of the lives of the people and the government was paying full attention to preserve those. He announced to give Rs 20 lakh annually for the Tehri Mahotsav and said that the government had made special efforts to bring far-flung areas of the state to the mainstream by developing basic infrastructural facilities like drinking water, roads, electricity, heath etc. He stated that Pandit Deendayal Upadhyay University would shortly be established in the district. He added that a hotel management/catering institute would also be established in the district. Cabinet Ministers Matbar Singh Kandari and Khajan Das, MLA Omgopal Rawat, Vijay Panwar, Chairman Zila Panchayat Ratan Singh Gunsola, Manujendra Shah, Teeka Shah, Gyan Singh Negi, Tourism Secretary Rakesh Sharma, Garhwal Commissioner Ajay Nabiyal, District Magistrate of Tehri Radhika Jha were also present on the occasion. Representatives of various associations, involved in a decade-old struggle to get their revenue land converted into free hold, today met MLA Rajpur Ganesh Joshi, who assured them of a solution after meeting the Chief Minister in this regard. A sense of urgency among traders emanated from the announcement made by the PWD recently according to which a link road would be built near local bus stand, Indira Market. The traders fear possession of their land to build the road. Joshi met District Magistrate Sachin Kurve in this regard, who assured him that no such link road would be built in the area. Kurve also gave an assurance of proper rehabilitation of those who would be affected due to widening up of the Lensdown Chowk. Mayor Vinod Chamoli also gave similar assurances to the traders. Kanchan and Irfan from Mussoorie were declared first runners-up on the occasion. Chief guest Neelima Azim, famous Bollywood star Shahid Kapoor’s mother, gave the citation and prizes to the winners. The contest was organised by the Yograj Cinevista Film Institute and production house. Shaila Sharma, after winning the contest, said the contest would provide her a base to move further in the tinsel town. She said she would work in a video album as announced by the organisers and then would eye on better roles in the Bollywood. Neelima, speaking to The Tribune, later said she was impressed with the talent showcased in the contest and wished them the best for the future. CEO Yograj said the winners would be introduced in his forthcoming big budget film in which Monisha Koirala would play the lead role. Decades of hard work, patience and determination alone can lead to accomplish a niche in the fraternity. Clad in a simple black and red cotton salwar-kameez, famous television and Hindi film actor Neelima Azim shared her journey in the tinsel town and future projects. After winning accolades for her acting in her first television soap “Phir Wohi Talaash” for Doordarshan, Neelima is now trying her hands in directing. “I have three projects in the pipeline, out which two films, ‘Nawab Nautanki’ (a satire) and ‘Dhua Dhua Sawera’ (a romantic comedy) are directed as well scripted by me,” quipped Neelima. “It will be, too, early to announce the lead actors of the film as the cast is yet to be finalised,” she replied on being questioned about the actors who would play the lead roles in her films. Neelima was in the state capital to judge the participants for the prince and princess of north organised by the Yograj Cinevista Film Acting Institute. She crowned the winners of the title, Shaily Sharma and Deepak Dhiman, who would get to play the lead roles in an upcoming Bollywood film. However, Neelima, who is a trained kathak dancer under Pandit Birju Maharaj, is going to participate in the National Dance Festival scheduled this month in Kolkata. She is soon coming up with a creative event that caters to all the genres of art forms, from classical to commercial, especially for the youth. “Being from a family of art lovers, I always aspired to learn different forms of art. I have learnt kathak, ballet and different languages and that had certainly helped me in polishing my acting skills. An actor can achieve success only when he or she can offer a complete package of excellent acting, dancing and is a linguist. I want to provide a similar opportunity to other budding aspirants through my future projects,” asserted the Indira Gandhi Award winner. On what she thinks about the talent Dehradun has, Neelima said, “The state has a lot of budding talents springing up these days. With so many producers and acting schools heading to the Doon valley, the aspiring actors can avail the opportunity to step into the film fraternity. We will surely provide the platform to newcomers residing in this part of the country. If invited by any acting school in Dehradun, then I will indeed visit the city again to hone the skills of budding artists in acting, music and dance”. Having witnessed a sea change in the film industry, the actor said nowadays, the films were audience targeted that links the viewer directly with the representation. “To sustain success is all the more important than to achieve it. It needs a lot of pain, patience and diligent work to establish oneself in the film industry, as there is no shortcut to it,” said Neelima, who started her film career with “Salim Langde Pe Mat Ro” in 1990. The actor has featured in many television serials “Phir Wohi Talaash”, “The Sword of Tipu Sultan”, “Junoon”, “Saans”, “Talaash”, “Kashmir”, “Dhoom Machao Dhoom” and “Dhoondh Legi Manzil Humein”. Neelima preferred not to talk about her son Shahid Kapoor’s ladylove in the media. “Everyone has some positive and negative point in itself, but that does not mean one should start publicising it. Let him get some privacy rather than discussing it in public,” signed off the actor mom of Shahid Kapoor. With Valentine’s Day a week away, cupid-struck couples are looking forward to go on a shopping spree. Preparations to celebrate the lovers’ day are in full swing. Florists in the city did a brisk business today, the first day of the Valentine week. A large number of youngsters thronged the shops to buy roses on Rose Day, irrespective of what it may cost them. On Rose Day, a single rose stick costs from about Rs 10-25, while bouquets range from Rs 150 to Rs 1,500 depending on the flowers and their arrangement. Petals, a florist at Ashley Hall, has put up a display card listing the days of the Valentine week. February 7 is Rose Day; February 8 Proposal Day; February 9 Chocolate Day; February 10 Teddy Day; February 11 Promise Day; February 12 Kiss Day; February 13 Hug Day and February 14 Valentine’s Day. Deepu, a florist, said: “Teenagers seem to be more enthusiastic to celebrate the week in style. Young married couples are also thronging my shop for buying bouquets on Rose Day. We are expecting to do better business than last year, apparently as the sale of flowers will prevail till Valentine’s Day”. However, the celebration of love seems to be an expensive and busy affair for lovebirds in the Doon Valley. Rekha, a salesgirl at a gift shop Art Home, says: “Boys usually buy bracelets, ear rings, rings, neck pieces, perfumes and other accessories. And if they are indecisive, we suggest to them to buy the heart pendant that is everyone’s favourite. We have bracelets costing Rs 200-300; rings cost about Rs 65-300 and neck pieces start from Rs 220-1,000”. Apart from this, eating joints and ice-cream parlours are decorated with heart-shaped balloons for the occasion. Sugar Box, Melting Moments, McDonalds, Nirula’s, KFC, Dominos and Pizza Hut are providing attractive offers on the occasion. Along with these hangout places, city bakers have also pulled up their socks to offer the best for the Valentine week. “Heart-shaped cakes and pastries with tempting flavours and nut-filled dark chocolates are in demand,” said an attendant at Elloras Bakery. However, many shops owners remained clear of decorating or advertising their shops for Valentine’s Day to avoid any untowardness. They fear hooliganism by some organisations that protest the celebration of Valentine’s Day and might damage their goods as well as shops. At a state-level convention held in Haldwani yesterday, the PRD jawans once again accused the state government of ignoring their plight and demands being raised by them over the past several years. They lamented that the jawans were now faced with a struggle for survival and must be provided regular employment. They also sought a PRD Battalion in the state on the lines of the Provincial Armed Constabulary. They also demanded compensation of Rs 5 lakh for the next of kin of the PRD jawans killed on duty. The PRD jawans, who had gathered here for electing a new executive of their representative body, submitted a memorandum of their demands to Cabinet minister Bansidhar Bhagat. He promised to take up the issues raised by them at the administrative level. The PRD cadres are seeking that they be employed for a major part of the year and not for five-six months as they find it difficult to make both ends meet. They also want the government to utilise their services to the optimum level by deploying them according to their abilities and be paid as per the work being taken from them. They have also suggested that just as the state government has created a cadre of Shiksha Mitras, a similar cadre called Raksha Mitras can also be formed that can be used in border areas of the state. They believe that this will help in checking crime as a local resident is better equipped to tackle situations in an area. Secondly, it will help in generating employment and preventing migration from the villages located close to the borders with China and Nepal. Shahi, speaking exclusively to The Tribune, said both the Congress and the BJP had misled the Gorkhas and used them merely as vote banks. He lamented the fact that the issues of the Gorkhas had been sidelined by both governments, be it the issue of including Gorkhas in the Central list of the OBCs or the complete development of the community. Shahi also said the Gorkhalis had major stakes in Uttarakhand, but still were considered second-grade citizens of the state and this ought to change. The GDF, which was established with the objectives of reaching out to the community and assisting them in their upliftment, was planning to field its own candidates in many Gorkha-dominated areas so that they could also be part of the economic and social development of the state. He also said further discussion in this regard would be held in due course of time and an extensive strategy would be formulated so that they had an equal representation in the state Assembly. The first half of this last quarterfinal was barren even though the two sides made some good goal-scoring attempts. The first goal came in the 49th minute for Garhwal Sporting when Ashok converted a penalty. Garhwal struck another goal in the 64th minute through Gaurav Sharma. Doon Eagle, Junior Cantt and Garhwal Boys have already registered their semifinal berths. Doon Eagle will face Junior Cantt in the first semifinal tomorrow. Opting to bat first after winning the toss, SDBM set a target of 182 runs in 30 overs. Shashank (74) and Kapil (32) helped the side put up a good total. Romy and Ahmed took three wickets each for Graphic Star. Vikas and Abhishek got two and one wicket, respectively. Batting second, Graphic Star achieved the target in 24 overs at the loss of four wickets. Amit (71*) and Ankur (42) fashioned the win of Graphic Star. Ashish of SDBM got two batsmen out while Anand and Marish took a wicket each. In another match played today, Rising Star scored a big 117-run win over OFD. The winning team had set a target of 184 runs in 25 overs and OFD could only score 67 runs. Batting first, RCA scored 98 runs for six wickets in 16 overs. 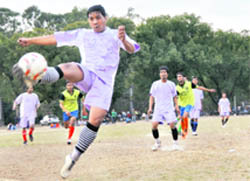 Shivam (26) and Ashwani (24) were the principal scorers. Dhanraj, Harsh Negi, BC Harbola and Pankaj Rawat got a wicket each for Doon XI. 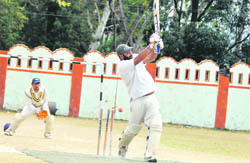 Doon XI achieved the target at the loss of six wickets. Dhanraj Sharma (24), Narendra Gadiyal (17), Neeraj Saini (16) and Ashish Joshi (15) contributed in the win. Pramod and Sachin of RCA got two wickets each while Sunjay and Shivam pocketed a wicket each. Hosts Raja Ram Mohan Roy Academy won their match against Shivalik, courtesy a better run rate in the first 10 overs, after the match ended in a tie in the Junior Boys Council School Cricket Tournament here today. RRRA won the toss and chose to bat first. They scored 99 runs before getting all out in 16.1 overs. Jatin (36), Bharat (17) and Abhishek (15*) chipped in for the batting side. Yash scalped the maximum (four) wickets for Shivalik. In reply, Shivalik also scored 99 runs in 20 overs at the loss of five wickets to tie the match. Harmeet (24) and Sanchit (27*) were the main contributors. The organisers decided to award the match to the team that had the better average in the first 10 overs.